In this Kershaw Brawler review, we show why the Brawler combines quality materials, pleasing aesthetics, and a sturdy build. All for a great price. The Brawler is a spring assisted, Tanto point knife that is the perfect companion for the outdoorsman and urbanite alike. This versatile blade comes razor sharp and stays that way thanks to a tough steel blend. Attached is a rugged, texturized handle that will remain comfortably in your hand no matter what the task. The knife is designed for use by both right- and left-handed users and can be used in a variety of situations. Read on to learn more about all of the fantastic features built into the 1990 Brawler. This is definitely a knife you will want to consider for EDC when compared to other pocket knives. 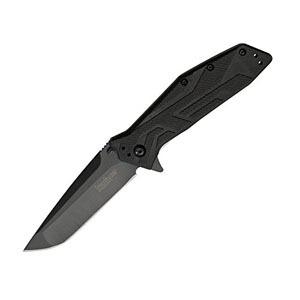 This installment of the Kershaw brand is ideally suited to a variety of jobs. The ergonomic handle remains hidden in a pocket, yet is easy to hold once the blade is deployed. 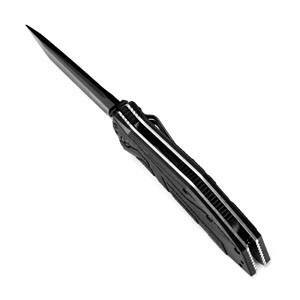 The unique tip allows for both delicate point work and devastating impact strikes when necessary. To make this knife accessible to novices and pros, an assisted open makes locking the blade a lightning-fast process. Add a special grinding pattern to the body of the blade to maximize efficiency then you have the complete package. Still not convinced that it should be the next addition to your EDC kit? The Brawler’s blade is composed of 8Cr13MoV steel under an oxide coating. The metal is a Chinese blend that has been heat treated to maximize edge retention and cutting strength and is a common material for use in urban knives like the Brawler. It has a hardness of around 57HRC (±2), putting it within the perfect Rockwell Hardness range for cutting blades so the edge will not easily roll during sharpening. The coating is a resilient black oxide that, when added to the corrosion resistance of the 8Cr13MoV steel, makes the blade as close to rust-proof as you can get. At the base are a rubber thumb stud and steel flipper that protrudes from the back of the closed knife. They are more convenient to use than opening it with both hands. They give you two ways to open the knife safely and quickly. When open, the flipper doubles as a finger guard as an added precaution against your hand slipping onto the blade. The Brawler has a Tanto tip with a rounded sub-tip. This makes the blade ideal for scraping or punching through hard materials like wood, plaster, and even sheet metal. The steel length measures 3 inches to allow for a long cutting edge. It is very thick from tip to base so it will not bend if used in puncturing applications. To add to the punching power, a swedge has been added to the upper part of the Tanto, narrowing the edge slightly so it can enter materials more smoothly. It is shallowly hollow ground and has great edge retention even after repeated use. The knife is unserrated and is made with a flat belly for easy sharpening and cutting. The jimping on the back of the base even leverages against the thumb to add traction. Overall, the blade is well made. It is able to stand up to repeated and varied use. The handle is made of a strong, glass-filled nylon (GFN) polymer called Zytel. This means that the nylon mold that forms the exterior of the handle was injected with fiberglass to increase toughness. It is a lightweight and resilient choice. This material is more flexible than others used in handles, such as resin or Kydex. It can withstand severe falls and strikes without shattering. Heat and abrasion do not affect it. Also, this reduces the price of the knife as it is easy and inexpensive to produce on a large scale. For maximum durability and life, GFN was the right choice for the Brawler. Another benefit of GFN: the cast that it fills can have any shape. 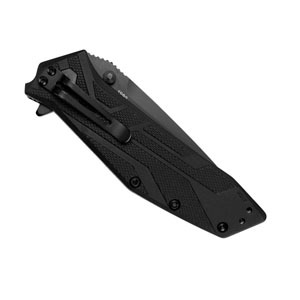 Kershaw took advantage of this to make the pommel contoured to the user’s hand and texturized for added grip. Although it has an angular design (intended to compliment the sharp profile of the Tanto tip), it still manages to fit nicely in your hand while giving the whole knife a unique personality of its own. The design of the handle is maze-like: jagged, linear shapes run parallel to the hand. The raised detailing on each of the two panels is overlaid with a waffled pattern that keeps them firmly within your grip regardless of weather conditions or moisture. The mechanism within the handle is solidly built and can withstand a lot of abuse. Within the scales is a ribbed nylon spacer between two thick, stonewashed steel liners. These give a nice color contrast against the black of the handle and blade. When deployed, the left liner locks the blade. There is no noticeable blade play once clicked into place. To release, it is just a simple matter of pushing the liner out and the steel in. As with many Kershaws, the Brawler uses a tension spring to assist in deploying the blade. This makes it very easy to open the knife singlehandedly at a moment’s notice. The spring lasts as long as the blade itself and, when paired with the locking component, stays true for the life of the blade. 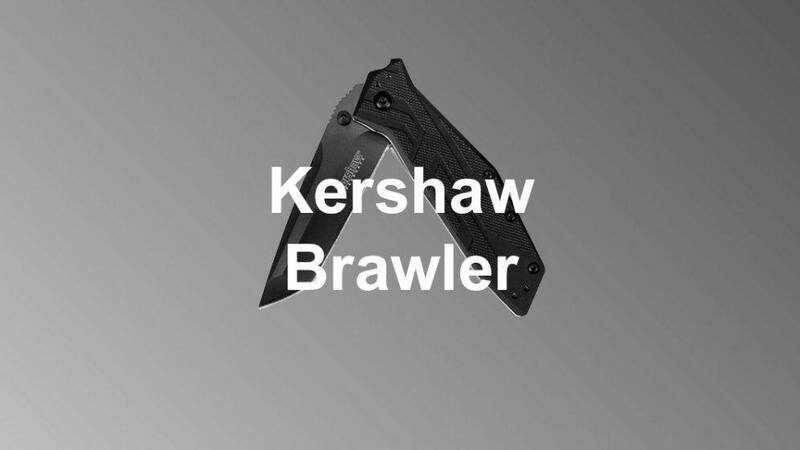 To summarize, the Kershaw 1990 Brawler is a well-rounded knife that is a great addition to any EDC kit. It is solidly constructed and withstands impact well. The Tanto tip, one of its signature features, works well in tactical situations as well as it does with everyday chores. The metal is a quality blend. The blade is specially designed for heavy duty use. The handle is made of a resilient synthetic polymer that is preferable to other common materials. It holds a spring and sturdy linear lock for increased ease and dependability. 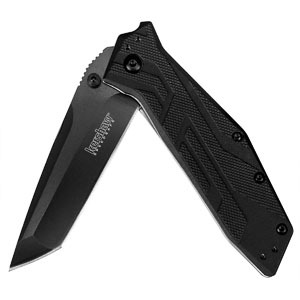 Overall, the Kershaw is an amazing knife for its price point and will serve you well for many years.